Debt Settlement Should Be a Last Resort | The Consumer Law Group, P.C. When you have reached the point where you are in over your head with multiple creditors, there is no easy way out. While debt settlement does allow you to pay your creditors less than you actually owe them, making this kind of arrangement does have financial consequences. Understand what the risks of debt settlement are so you can make the best decision for your financial future. Don’t wait. If you wait too long to address the issue with a creditor, you may miss your chance to arrange for a debt settlement. In fact, if you contact the creditor early enough, you may be able to arrange for a payment plan that is not a settlement, which will protect your credit rating and future borrowing options. Don’t overlook the consequences. While it may seem like you’re getting off easy by arranging to pay less than what you owe, there will be repercussions. You will not only be responsible for paying taxes on the difference between what you owe and what you have agreed to pay, but your credit score will be negatively impacted as well. Don’t make promises you can’t keep. Do not agree to a debt settlement plan that is unrealistic for you. Be honest about your finances and only agree to what you know you can manage. If you default on a debt settlement, you may be liable for the full amount owed with no defense. In this economy, creditors are often willing to work with consumers in order to recover some of their losses. 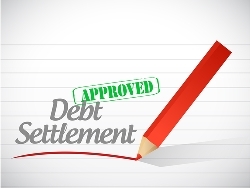 This could be good news for you if you are looking to negotiate a debt settlement. If you have made good faith efforts to work out a settlement and are meeting with unreasonable resistance from creditors, contact the attorneys at The Consumer Law Group for help. We have years of experience helping clients get out of debt and we may be able to help you too. Fill out the form on this page for more information.